So in addition to an earthquake shaking us up in New York for thirty seconds, I finished this novel the other day and I want to tell you guys about it, because, as usual, it has spawned an idea. And it's really, really good and you should run out and get it right now. 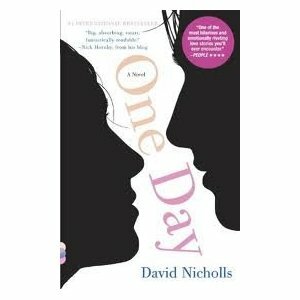 The book is called One Day by David Nicholls. It is about Dexter and Emma, who meet at their college graduation on July 15, 1988. The book then follows Dex and Em through their lives--their friendship, careers, mistakes, drunken nights, relationships--every July 15th for the next twenty years. So basically, chapter one is July 15, 1988 and chapter two is July 15, 1989. Because sometimes it's nice to borrow other people's characters instead of analyzing your own. So I wrote this after re-reading some old fanfiction on my computer and online. Because sometimes it's nice to borrow other people's characters instead of analyzing your own. Author's Note: I want my season 2 of Downton Abbey now. I saw this clip and of course, my mind spun off into directions. Also, I can't remember the last time I wrote a fanfic based on a show or a movie, so….be gentle. Disclaimer: I don't Downton Abbey. Obviously. If I did own it, it would be the Branson and Sybil show. "They sent me this really gorgeous black-and-white cover of an older black woman's hand holding a white baby's hand. I told them I loved it and within thirty seconds, they called me and said, 'Oh my God, no, we can't use that... people might think it's about race." I've been thinking about race a lot lately anyhow, but reading and finishing The Help has me ruminating on the topic, so just bear with me for the epic length of this post. A lot of this--most of it--is because of my book, which is not nearly as finished or polished or as complex, as of yet, as The Help. And of course, since The Help is set in the American South in the early 1960s, when Jim Crow was still the order of the day, it's a familiar setting to American readers because we all had to learn about it in school. It's part of American history, one that is still definitely very much felt till this day. I'm sure you've all heard of this book or the upcoming movie starring Viola Davis, Octavia Spencer and Emma Stone. It is about three women living in early 1960s Jackson, Mississsippi: Aibileen, a longtime black maid who has raised seventeen white children; her outspoken friend, Minny, who is just a too opinionated for the comfort of the white ladies of Jackson to employ her as their maid; and Skeeter, a white girl, a recent college grad and aspiring writer, who wants to write about Jackson and its people--but from the perspective of the help. I give you, Mr. Tops--the traveling triceratops. You can look for updates in the sidebar with the other blogs I follow. These authors write non-fiction, so I think their advice on not reading similar subjects while writing may work for them, but doesn't necessarily work for me. I would think that non-fiction, non-memoir involves a ton of notes as well, so I'm ignoring the organizing of interviews and research. I did a bit of work in that direction when I was ruminating over Iggy, by using wikispaces as a more comprehensive way to organize myself so I could really see what I had. So I was reading some stuff online Saturday at PortCities Bristol, trying to see if the Big Traumatic Moment for one of my characters was even plausible in 1800. The answer turned out to be not likely. But what is likely is that the characters would encounter several fat, rich, self-satisfied slave ships owners in the city and I can twist Big Traumatic Moment that way. But as I read, I came across a mention of the Society of Merchant Venturers in Bristol. It started as a guild and ended up largely running the city of Bristol and its port for centuries. They had a huge economic impact in Bristol in that the Society argued against a London society that had a monopoly in the slave trade.